We all know how easy it is to get caught up in the Christmas spirit and gift-giving frenzy. A lot of time and energy is spent thinking of the "perfect gift" for friends and family. While I'm sure many are successful in this endeavor, there are undoubtedly a large number of gifts given that people would rather trade in for cash—even if that cash amount is less than the retail price of the good. Thanks to eBay's anonymous online service, consumers can now do just that! According to a recent study from eBay, more people than ever will sell unwanted items this year. The ongoing recession is partly to blame: many people can probably use the cash from selling gifts to lower their credit card debt, pay their mortgage, or simply cover the bills. 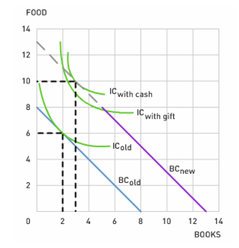 But people's general preference for cash to gifts can be explained using the economic fundamentals of utility. Now that the holiday season has come and gone, many of us find ourselves thinking, "What will I do with another FM transmitter for my iPod?" 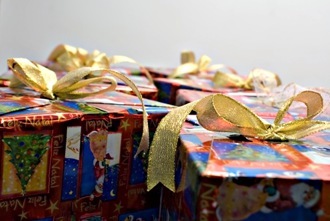 Oftentimes, both the gift giver and gift receiver could be made better off (that is, receive a higher level of utility or happiness) if a cash exchange had taken place instead. To understand the economic rationale behind this, we turn to the basic consumer theory model of budget constraints and indifference curves. 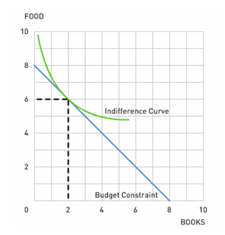 Recall that an indifference curve maps out all the possible consumption bundles of goods that yield the same level of utility to a given consumer. Indifference curves tell us nothing about what we can afford, but rather how happy a particular bundle will make us. On the other hand, budget constraints show the consumption bundles that we can buy given our income and the prices of goods. Similarly, budget constraints say nothing about what we would like to buy, but rather what we can afford. 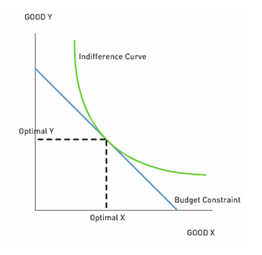 A consumer's optimal bundle of goods is located where the budget constraint is tangent to the highest possible indifference curve. In this case, the optimal consumption bundle does not satisfy the tangency condition because there is no tangency in this restricted region of the budget constraint; we call this a corner solution. 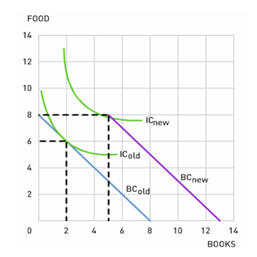 In other words, if instead your grandmother gave you the cash she spent on the books (5 books x $10 per book = $50), your budget constraint would also include the grey, dashed region below, and you would be made better off since you can now consume 3 books and 10 units of food. 1. How much money could your relative have given you, instead of the present, that would leave you at least as well-off as if you had received the present (that is, with the same level of utility)? Draw this on a standard budget constraint-indifference curve diagram. 2. What elements of real life does standard consumer theory ignore? 3. What gifts, if any, could your grandmother have given you instead of 5 books that would be just as good as if she had given you the cash she spent on them?